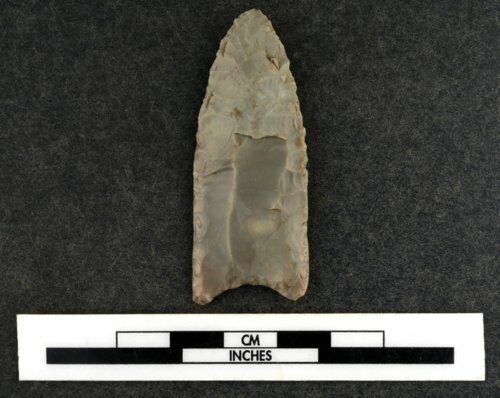 This type of Paleoindian point is called a Clovis and functioned as a spear tip. It was found along the Kansas River and donated in 1925 to the Kansas Historical Society. Early Paleoindian people are thought to have been highly mobile, small bands that hunted large game, including some now extinct species. Stone tools help reveal how these people lived, traveled, and differed from other groups. Early Paleoindian points are often long, thin, and narrow, and have one or more short flakes called flutes removed from one or both sides of the point base.